If you are the 'Gloucestershire Vintage and Country Extravaganza' organiser and you would like to update or amend the details shown, please contact us. Thank you. When is the next Gloucestershire Vintage and Country Extravaganza? Friday 2nd to Sunday 4th August, 2019. Gloucestershire Vintage and Country Extravaganza is listed under August 2019 Shows. Although we try to keep the information for this event as up to date as possible, we cannot guarantee that things haven't changed at the last minute, and we haven't been informed. Therefore, please contact the 'Gloucestershire Vintage and Country Extravaganza' event holder directly to confirm all details (especially event name, dates and location) before setting off to Northmoor Lane. The Gloucestershire Vintage and Country Extravaganza is planned to take place at South Cerney Airfield, Northmoor Lane, Cirencester, Friday 2nd to Sunday 4th August, 2019. You may reach the event organisers on 01452 89 0891. The 45th Annual Gloucestershire Vintage & Country Extravaganza South Cerney Airfield, Cirencester 2-4 August 2019 2-4 August 2019 will see the Stroud Vintage Transport & Engine Club (SVTEC) stage their Annual Show at South Cerney Airfield in Cirencester, Gloucestershire. 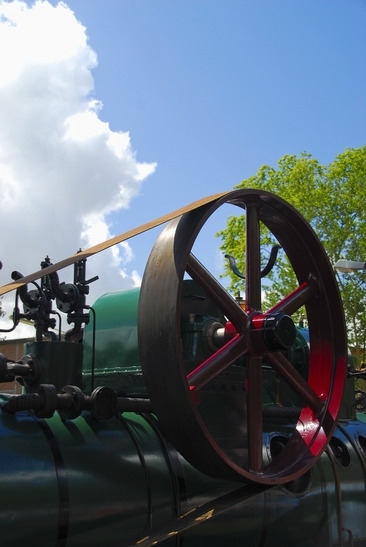 The show is widely regarded as one of the biggest and best Steam, Vintage and Countryside events in the UK. This year features nearly 1000 classic cars from pre and post war, including over 70 Classic American cars, 30 visiting car clubs, 335 motorcycles and scooters, 80 bicycles from 1903 - 1980, 30 miniature steam engines, 90 stationary engines, 70 full size steam engines, model engineering, 200 Tractors, over 70 Buses and Coaches, 130 military vehicles, 315 emergency and commercial vehicles, 70 industrial trucks, 50 vintage caravans and a large model aircraft flying display. The live arenas showcase non-stop demonstrations including the exquisite showman’s engines, full-size steam engines to dancing tractors, the Tigers children’s motorcycle display team, a Parachute display team to falconry displays, popular dog show and hilarious ‘Sheep Show’. Aside from the vintage vehicles, its packed with thousands of curiosity stalls, 180 trade stands, model tents, craft marques to a large Vintage Fun fair. Rally Chairman Martyn Slater ‘Our goal has always been to give the best value for money family day out in Gloucestershire, with something for all of the family to enjoy. We are very proud of it, it’s one of the largest events of its kind, run by volunteers and whilst the show has evolved over the years, our mission remains the same - to inform, educate, celebrate and preserve our unique transport heritage. This year we have a record number of vehicle entries confirmed, so 2019 is set to be our biggest show yet in our 44-year history’. The non-profit making organisation raises money for national and local charities. The show opens daily 10.00am - 5.00pm. Free vintage bus service operating around the perimeter of the show site, and to and from Cirencester Town Centre and Kemble railway station to the show ground connecting with selected First Great Western Trains inc Stroud, Glos and Chelt. Please refer to the event website for the bus timetable. For further show information or to purchase advance discounted tickets visit: www.glosvintageextravaganza.co.uk Ticket Prices: Ticket prices remain frozen for the 10th consecutive year Fri: Adult £7, junior £4. Sat or Sun: Adult: £10, junior £5 Weekender (Fri- Sun) Adult: £15, junior: £8 Family Weekender ticket (2 x adults, 2 x junior) for all three days: £35 Children under 5 years old go free You can Follow us on Facebook: GloucestershireVintageandCountryExtravaganza and Twitter: @GlosExtrav For further information or to purchase advance tickets please visit: www.glosvintageextravaganza.co.uk.